Seibertron.com Energon Pub Forums • My puny Collection. "Even in death there is no command but mine!" "Humans don't deserve to live!" "Then you will die with them, join them in extinction!" "You still fight for the weak, that is why you lose!" Looks like a good start. Keep these pictures so you can look back at them in a year and say "wow, I only had that many?" Hey, how do you like Tuner Mudflap? With all the surplus I've considered him and his twin Tuner Skids. He's alright, but hard to transform, at least for me. I'm sure I five year old could do it better. You've got many great choices there in my opinion. Keep on collecting! One new addition to the collection but it's an awesome one IMO. I_AM_MEGATRON wrote: One new addition to the collection but it's an awesome one IMO. Great choice. I wish I had that one myself. Can't have a movie collection without a leader class Optimus Prime. Yep, now I want a leader class Megatron. 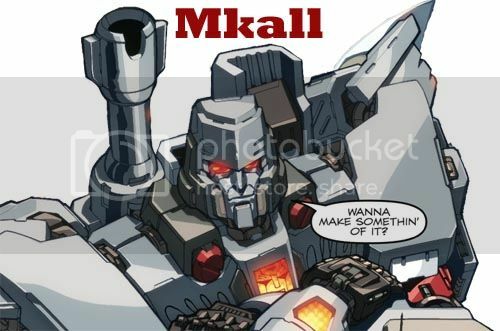 Motto: "Theatricality and Deception, Powerful agents to the unintiated"
may i also recommend skids unless you already have him i think he looks really good next to his buddy mudflap. anyhow great stuff keep it up. An update to my Collection, it's getting bigger. Ahhh, even toaster-bot. Thats one TF I wish would have been made a legends class. Nice and growing. This has to be the best time honestly to collect cause of the movie. Motto: ""I like band- it's my day off from my day." 4,446 pages were recently viewed by 862 unique visitors. This page was viewed 1 times on Saturday, April 20th 2019 3:15am CDT. © 2019 Seibertron, Inc. DBA Seibertron.com. All Rights Reserved. Established June 2000. Seibertron.com is owned by Ryan Yzquierdo.